Warning: This technique keeps my open rate ~40%. If you’d like low open rates and un-engaged readers, stop reading now. A lot of people want a lot of subscribers. They get excited about growing their list + get so excited about the top number that they forget about the other factors involved (including quality, open rate and subscriber activity). If they keep it up, they’ll notice their top number (total subscribers) increases, but other metrics (revenue, opens and activity) actually decrease! So, it surprises some people that every month I delete at least 30,000 subscribers across the board. Here’s one of my latest months for proof (with just a few more than 30k this time – I went a bit overboard). I posted a tweet about this and got a lot of reactions, so I thought I’d dive into more about how I do this. First of all – why do I do this? There are a lot of reasons to do this. Most of them I touched on in the tweet. While lots of people want big lists, what you really want is a list worth having. Having a big list of people who mark your stuff as spam or just ignore you isn’t worth much. You might be able to use the number to brag in some marketing copy, but you’re not going to actually get much out of the list. You’ll have someone talk about their list size being 200,000 people, but their open rate is 6%. By deleting inactive or dead subscribers, you update your list and give people a chance to re-engage with you – even if it’s been a few months. If you have a great big list and have great engagement, then you’re fine. If you don’t have that, then you might want to start deleting people. It also gives you a better grip on the current situation with more realistic feedback and lets you take corrective action where necessary. Have been subscribed for 30 days at least. Haven’t opened an email in the last 90 days. Once I’ve figured out this cross-segment, I tag them as “dead” and prepare 3 emails to be sent to these guys. Pro tip #1: If you use ConvertKit, I bugged them into making this a built-in feature. You’re welcome. Once I’ve identified the inactives, I send them 3 emails. It looks like you haven’t opened an email from me in a while. What’s up with that? Here at IMPOSSIBLE, I’m trying to focus on positive people who are looking to get healthy & most importantly – want to hear from me. That’s why, next week, I’ll be removing people who haven’t opened my emails in a while. I’m emailing you to because you’re on that list. If you’re no longer interested in IMPOSSIBLE or don’t want to hear from me, that’s fine – I’ll be taking you off the list next week. If you just got behind the past couple months, click the link below and I’ll add you to the “safe” list. Again, if you’re not interested in hearing from me, you don’t have to do a thing and I’ll take you off this list next week. p.s. here’s the link one more time. Here, I send the same email as email #1, but only send it to “unopens” or people who didn’t open the first email. Pro tip #2: “Send to Unopens” is such a powerful feature that I actually paid ConvertKit to specifically build this feature for me (proof). It’s now built into the platform for easy use. It’s [Your Name] with [Your Site Name]. I haven’t seen you open an email in a while, so today is the last email you’ll get from me. I don’t want to leave you empty-handed, so here are a few parting tools & resources you might find helpful on your way forward. That’s all I got for you today. Best of luck on your journey and stay healthy out there. p.s. If you’d like to come back and get emails from me – you can sign back up anytime right here & get free [opt-in download]. If any reader clicks any link in the email, they’re untagged as “dead” and moved to a safe list. Pro tip #3: On ConvertKit, you can use the “automations” feature to do this pretty easily. Play a happy song while you’re doing it and you’ll feel better. Then, go take a cold shower or ice bath. Deleting your subscribers might hurt, but the cold is a good reminder that there are worse feelings in life. Yea, you got a bunch of questions, here are the ones I get most frequently. Doesn’t this reduce the size of your list? Yes & no. Yes, it immediately reduces the size of the list, but if you have a proven method to continue growing your list, it shouldn’t be a problem. The benefit here is that it doesn’t let you get complacent. You have to constantly re-evaluate the state of things, and continually get better and find new ways to grow it. If you’re finding out that you can’t replace the dead subscribers with new, active ones – then boom – you have a major hole in your business. What if they got behind? That’s what the follow up emails are for. I include ways for them to re-subscribe and get back on the list if they want. If they’re too busy to read their email, then they’re not going to pay attention down the road anyways. If they open up the email after I’ve deleted them, there are ways for them to get back on board. What do you do about customers who’ve paid for access to a product? I keep them on a separate list. They’re not a part of this process. What happens to my list that I worked so hard to build? You have to ask yourself a question of why you have that list in the first place? Is it to feel good about yourself? Is it to brag? Or is it to be effective? If you want to brag or use vanity metrics so you can run Facebook ads to your video of you having a list of hundreds of thousands of (junk) subscribers, keep them on your list. If you want them to actually be useful, focus in on the people responding to your message, then regularly trim the list. Numbers matter, but only if you’re looking at the right numbers. Worrying about the total number of subscribers you have without any context is just vanity numbers. You can keep them on your list all day long, but they ain’t gonna do crap. You can brag, but you won’t build a business or impact them in any noticeable way. Instead, measure the right things. Focus on quality. Final note: Many of these strategies you can implement in different ways across most email providers. As customer #88 of ConvertKit (*puts hipster glasses on*), I bugged them early on to add a bunch of stuff so I’m partial to their product. You can read my full review on ConvertKit here or get started with them here. Edit: Of course, right before I posted this, my buddy Sol wrote up a similar article on how he does this exact thing. His article focuses much more on re-engagement, but the concepts are similar. You can read it here. Great concept, process and swipes! Mucho appreciated! Joel, I was wondering, what do you do with email subscribers that unsubscribed themselves? Do you delete them as well or do you try to get them back on board again? 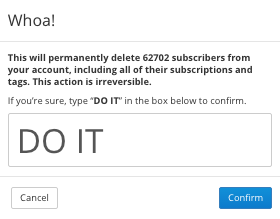 They are already removed when they unsubscribe.